Dropsy is an old medical term for a condition that today would be more likely called edema—the swelling of soft tissues in a body cavity, such as the abdomen, due to an accumulation of water and other fluids. The English term derives from the Middle English word dropesie, from the Old French word hydropse, and from the Greek word hydrops, which is itself a derivation of hydro, meaning water. Although the term dropsy is rarely heard in human medical science these days, it is still used to describe a particular health issue with aquarium fish. 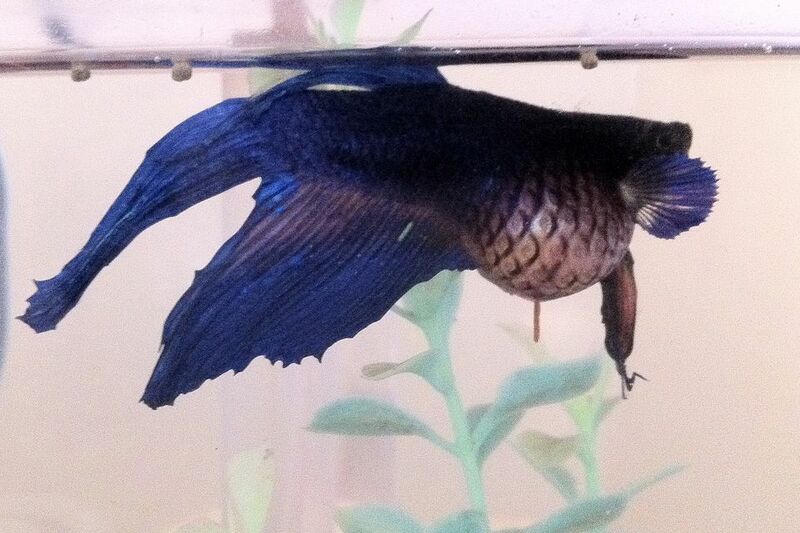 Dropsy refers to a condition in which fish often have hugely swollen bellies, and the continuing use of the term probably has to do with how it so accurately depicts the visual symptom: the belly drops down. Sometimes the condition is also known as bloat. Dropsy in fish is actually a cluster of symptoms caused by an infection from a bacteria commonly present in all aquariums. Consequently, any fish may harbor the dropsy-causing bacteria, but healthy fish rarely fall prey to the disease. Fish are only susceptible when their immune system has been compromised by some other stress factor. If all the fish in the tank are under stress, it’s quite common for the entire tank to become infected, but it is also possible for only one or two fish to fall ill, especially when prompt action is taken to prevent the spread of the bacteria. As the infection progresses, skin lesions may appear, the belly fills with fluids and becomes swollen, internal organs are damaged, and ultimately the fish will die. Even with prompt treatment, the mortality rate is high. Successful treatment is very unlikely unless a fish is diagnosed in the early stages of the infection. Symptoms of the underlying bacterial infection can vary widely. Some fish will have the classic swollen belly, others display skin lesions, while still others show few symptoms at all. This variability is what makes diagnosis difficult. In most cases, a number of symptoms are observed, both physical and behavioral. These symptoms occur progressively as the disease advances. Internal organs are affected, most notably the liver and kidneys. Anemia occurs, causing the gills to lose their normal red color. As the abdomen fills with fluid, organs are pushed aside, sometimes causing the spine to curve. Scales protrude from the body, giving the appearance of a pine cone. This symptom is a classic indication of a severe infection. The agent that causes the symptoms of dropsy is usually the very common Aeromonas bacteria, one of several so-called gram-negative bacteria present in most aquarium habitats. The bacteria is known as gram-negative because it does react to a common gram-staining identification procedure. Generally, a single or short-term exposure to stress will not compromise the ability of the fish to fight infection. In most cases, the stress exposure must be present for an extended period of time, or several stress factors must occur in rapid succession, in order to affect the fish's immune system. Move the sick fish to a "hospital tank." Feed the fish fresh, high-quality foods. Treat the fish with antibiotics. It is important to move any infected fish to another tank to separate them from the remaining healthy fish. While the affected fish are quarantined, perform a water change on the original tank and monitor the remaining fish closely for the appearance of symptoms. Salt should be added to the hospital tank, again at the ratio of 1 teaspoon per gallon of water. Keep the hospital tank scrupulously clean, and perform weekly partial water changes. Provide the ill fish with a variety of fresh, high-quality food. Often this is enough to resolve the infection in cases that are not too far advanced. Keep the fish under observation for several weeks after the symptoms disappear. Antibiotics should be used if the fish does not immediately respond. A broad-spectrum antibiotic specifically formulated for gram-negative bacteria is recommended, such as Maracyn-Two. A 10-day course is ideal for ensuring the infection is eradicated, but you should always follow the manufacturer's directions for duration and dosage. Use flake foods within one month of opening the packages. If the tank is well maintained and the fish are fed a healthy diet, outbreaks of infections causing dropsy are unlikely.